Ayurveda is a ‘holistic’ science. At least that’s what you must have heard or read somewhere, before reading this post. But have you ever given it a thought? As to what exactly does it mean by holistic? What difference does it make? Is it really that important or is it just a glamorous word in a medical field? The subject (or in layman’s language, a patient) has always remained of tertiary importance for modern science. The center of attention was and is – the disease and not the ‘diseased’. This omission substantially narrowed down the lens of observation. This disease-centric approach viz. objective (and indeed an important aspect) cuts down the equally important – subjective approach i.e. body-centric which in simple words means observing not just a disease but a person suffering from the same. Ayurveda contemplates….it eyes both the aspects equally; because understanding a sufferer is as important as understanding the suffering. That’s what holistic is all about! The fundamentals on which this all rests are the 3 pillars – dosha (vital and ultimate elements), dhatu (various bodily tissues holding the body) and mala (excretory products). Most important among these fundamentals, are the 3 doshas owing their unquestionable significance to the authoritative management of the whole body through the 7 dhatus and 3 malas. They are the ultimate, presidential and inescapable entities of human strata. They have a presiding effect on every material, anatomical, physiological, physical and psychological features of our bodies. Their working area is extended from head to toe, leaving nothing out of their order. If this is so, how do they do it? We are an integral part of Mother Nature. Everything we need for living is resourced from it. We arise from it, we live with it and unite with it after death. This observation made the ancient physicians think about the similitude between human body and nature. And in the process of understanding, they reduced the energies of nature to threefold – air, fire and coldness which represent motion, conversion/change and uniting/associating forces respectively in outside world. 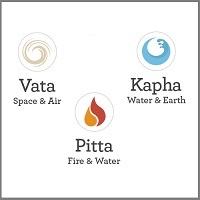 These three express themselves in the inner environment of a human body as – Vata, Pitta and Kapha. Every metabolic function happening in a living body is a part and parcel of doshic system. Every movement – be it your respiration, pumping of your heart, food passage through the digestive tract, excretion, functions of your senses & mind and every motion occurring in your body is governed by Vata. Along with these, speaking, hearing, tactile sensation, keeping digestion at an optimum level, joint movements, maintaining freshness & enthusiasm are all exercised by Vata. Though our body is a miniature expression of nature, there are differences. You can’t just go in open and eat whatever we like and expect our body to grow. Change is mandatory. Pitta, embodying the functions of fire from outer environment, is responsible for a change in a form of anything entering a body from outside so as to get adapted and assimilated to our inner environment. It is responsible for digestion, vision, skin color & its glow, temperature regulation of body and many others. Kapha on other hand is an associating force, responsible for binding and connecting different tissues and cells and is directly responsible for growth. Understanding various tastes, unobstructed joint movements by providing those with cushions in between, strength and virility are maintained by Kapha. Same features of motion, change and association can be attributed to the level of mind. A controlled motion of thoughts without bewildering speed by vata, analytical thinking of perceived thoughts by pitta and stability and calmness under any circumstances by kapha maintains psychological health as subtly as nature of mind. The quantitative and qualitative balance of these three is critical for health. If one of them goes off balance, illness comes in. Their equivalence is given so much importance by Ayurvedic texts and physicians that their harmony is virtually considered as health and disharmony as illness. Wherever there is association there is kapha. This is the most subtle yet clinically and practically expounding principle of the Ayurvedic system of health, going beyond boundaries of country, caste, and creed.